The documentary begins in cold Chicago, on the front porch of a multi-flat building where Alexius and Romeo first lived as kids when they moved to the urban Midwest. Alexius starts talking about his embarrassment regarding his heritage during his early years in America – he would tell people he was French or had other origins, but avoided his Haitian roots. This is the jumping off point for the story of Alexius and Romeo, returning to their Caribbean homeland after 28 years, to find their half brothers in the aftermath of the crushing earthquake in Haiti. In their delicate and emotional journey, the contrast of homecoming and understanding what home means becomes the energy of “Lakay.” The film is an affecting and heartfelt voyage of two souls finding something about themselves that they didn’t know existed…until they went home. Tirf Alexius and Remoh Romeo are brothers and business partners. They have found the American dream after their humble beginnings as boys from Haiti, adapting as adults in the urban environment of Chicago. When their mother calls and informs them of the earthquake in 2010 (“Haiti is broken”), they become determined to go back to the island for the first time since they left as children, to find relatives and bring aid to the earthquake victims. When they get to Haiti, they find a country reeling from massive destruction – the earthquake registered a catastrophic 7.0 on the Richter Scale. Government and outside aid was in disarray, and even getting around was difficult. 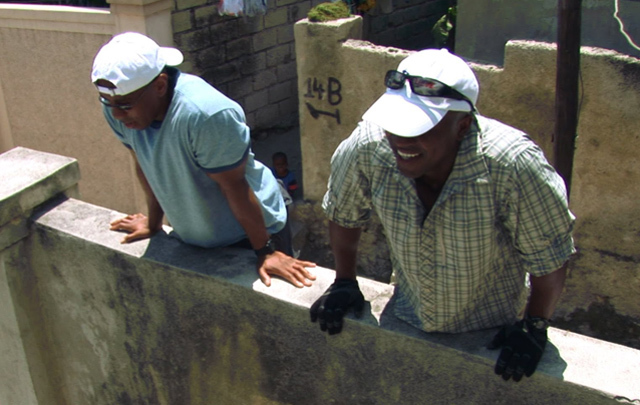 As the brothers searched for their relatives, they found their childhood home still standing, they gained an understanding on how their fellow Haitians survive, and they created a fulfillment within themselves that they was both unexpected and rewarding. Alexius and Romeo used all of their craft and resources as filmmakers in constructing the story. Alexius is a voiceover artist, and uses three of those voices within the film – his narrator voice, the Chicago-guy-on-the-front-porch voice and his fluency in the native kreyól language of Haiti – the film inserts kreyól subtitles for the Haitian audience. Alexius surprises many of the natives with the use of the language, and that produces many beautiful moments in the film. The porch stories, which frame the Haitian journey, are as indelible as the brothers traveling in their native country. There is a dignity as they tell some of the Chicago stories – Alexius accompanying his father to translate for him, Romeo remembering their drafty rooms in a Chicago winter, and both brothers feeling like outsiders in the urban school system. The porch sessions add so much to the film, and enhances the Haitian story by contrasting the locations. The filmmakers had a knack for finding the stories in Haiti that blessedly illustrated their trek to enlightenment. They came upon a soccer match and couldn’t help but join in. They highlighted a beachfront – not too far from the wreckage of the earthquake – which articulated the country’s beauty. They sought to understand more about their family, so far away for so long, now lost among piles of rubble that for the natives had become a pit of despair. Most importantly, what they also found was a vital puzzle piece in their immigrant experience. By going home to Haiti, they gave themselves the gift of pride in their people. They witnessed the extraordinary hope surrounded by death and destruction, and they related it to their own hope in the struggle to succeed in America. And although the odyssey came to a natural conclusion, it also signaled an eloquent new beginning in the lives of Tirf Alexius and Remoh Romeo. What is America, but a melting pot of seekers from elsewhere, looking for refuge and finding their new lives in a overwhelming mishmash of people and purpose. “Lakay,” translated as “Home,” may be about Haiti, but it is also about all countries left far behind, and all of us who came from over there to find another life. We are Haitian. We are Americans. We are citizens of each other.